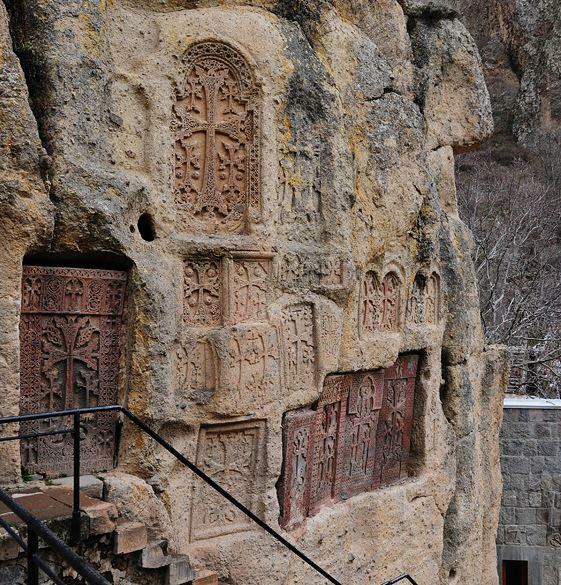 The Geghard complex is an exceptionally complete and well-preserved example of a medieval Armenian monastic foundation in a remote area of great natural beauty at the head of the Azat valley, surrounded by towering cliffs. 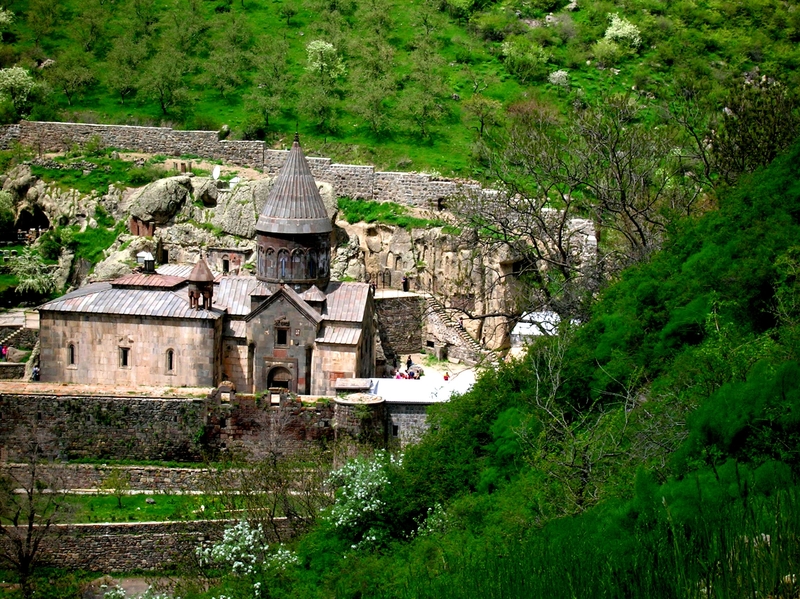 It contains a number of churches and tombs, most of them cut into the rock, which illustrate the very peak of Armenian medieval architecture and decorative art, with many innovatory features that had a profound influence on subsequent developments in the region. It was founded in the 4th century, according to tradition by St Gregory the Illuminator. The first monastery was destroyed by Arabs in the 9th century, but it was flourishing again by the 13th century.The monastery was more famous because of the relics that it housed. The most celebrated of these was the spear which had wounded Christ on the Cross, allegedly brought there by the Apostle Thaddeus, from which comes its present name, Geghardavank (the Monastery of the Spear), first recorded in a document of 1250. 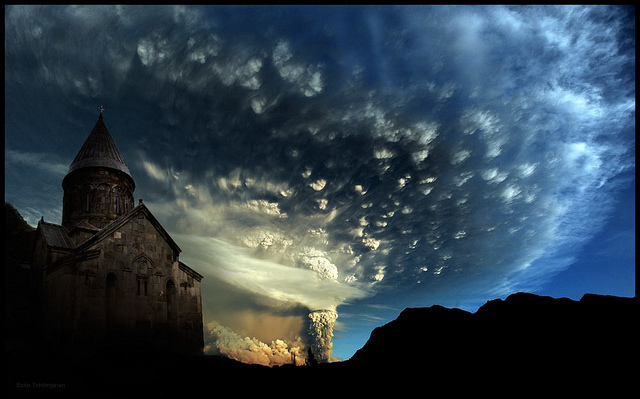 This made it a popular place of pilgrimage for Armenian Christians over many centuries. Relics of the Apostles Andrew and John were donated in the 12th century, and pious visitors made numerous grants of land, money, manuscripts, etc over the succeeding centuries. It was founded in the 4th century, according to tradition by St Gregory the Illuminator. The site is that of a spring arising in a cave which had been sacred in pre-Christian times, hence one of the names by which it was known, Ayvirank (the Monastery of the Cave). The first monastery was destroyed by Arabs in the 9th century, but it was re-established and was flourishing again by the 13th century under the patronage of the Proshyan princes, who are buried there. They provided it with an irrigation system in 1200, as well as paying for the erection and reconstruction of most of the churches in the complex. At this time it was also known as the Monastery of the Seven Churches and the Monastery of the Forty Altars.